This is a great start of the winter meal to eat on a cold and snowy night. 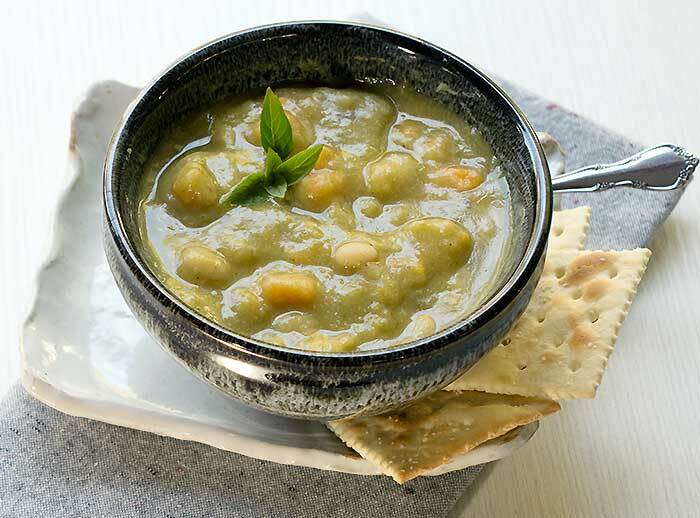 My Slow Cooker Split Pea Soup uses ingredients that are probably sitting in your pantry, and you just throw everything together and cook. There’s almost no prep at all! I whipped up this Slow Cooker Split Pea Soup for a party a few years ago. You would be surprised at how many people asked for this simple recipe. It’s so simple to make that I wasn’t thinking about writing it up. But it definitely got a great compliment to effort ratio, so I thought I better share it with you! 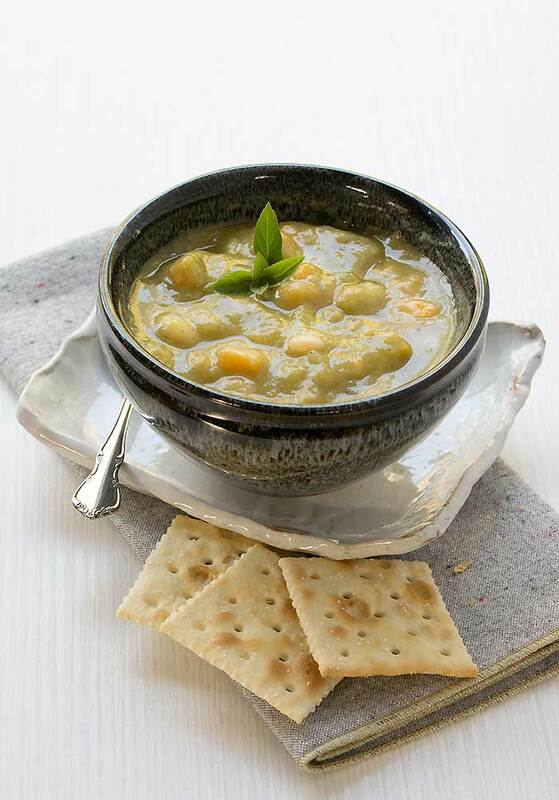 Why Is Split Pea Soup so Popular? One of the main reasons is that it’s inexpensive to make. It’s also easy to make, has just a few ingredients, and it can cook all day in your slow cooker while you are off doing other things. Looking for the Instant Pot version of this recipe? It’s on my new blog, Plant Based Instant Pot. Add the water, sweet potato, split peas, navy beans, bay leaves, and liquid smoke to your Instant Pot and cook on high pressure for 20 minutes. Let the pressure release naturally. Add the water, split peas, navy beans, bay leaves, and liquid smoke to your 3 1/2 to 5-quart slow cooker and cook on low for 7 to 9 hours. Where Can I Get the Beautiful Heather Napkin? It’s from Beautiful Ingredient. She makes amazing handmade napkins, potholders and more! The cool bowl and plate I found on one of my thrifting trips. That’s a great place to look for a used slow cooker, food processor, or blender too! Sounds good but where are the sweet potatoes (in the title)? How much do you use? Whoops! I guess I had a little too much vacation 😉 – it’s updated now. Thank you for catching that. Does it matter if the navy beans are pre-soaked? This recipe is for unsoaked beans. But if you’ve already soaked yours use a little less water. What is an Instant Pot? This recipe looks delicious! My beans and split peas never softened in this recipe, and it remained very thin and broth like. Didn’t look like your photo. Not sure where I went wrong? I’m happy to help you trouble-shoot. Did you use the Instant Pot or the slow cooker? My results were similar to Marlene’s, although my beans and peas were plenty soft. The soup was just way too runny. I blended it with an immersion blender, and that thickened it up a bit, but it was still thinner than I would have liked. When measuring the 5 cups of water, I went by the lines on the inside of the pot. Afterwards, I measured out five cups from a measuring cup, and it came to somewhat less than the 5 cup line on the pot. So maybe that was the problem? The measurments in the Instant Pot do not equal our US cups. It’s important to use a proper cup measure instead of the measures inside the IP. This looks so good, can it be done in a stock pot? It can be. I don’t know the exact cooking times but it should be easy to tell, you might also end up adding a little more liquid. I didn’t have any of the problems that some of the other commenters mentioned. My only regret is not having some toasted bread for dunking. I’m not sure why you’rs didn’t thicken up. Did you turn it to saute after you released the pressure? You can always reduce anything that way. Sorry you didn’t like the amount of nutritional yeast that I do, but you can always start by adding a tablespoon at a time. I made this last week, and my husband and I LOVED it!! But there wasn’t enough for leftovers, which we enjoy. So for a double batch, do I put it on for 40 mins? or still 20 mins? It should cook in the same amout of time. Very good soup. Yum. My navy beans were not quite soft enough in the Instant Pot so I let the soup sit in the Pot with lid for a long time afterwards, and everything came out great. I didn’t need to use an immersion stick to blend it up, it all mushed together well. I used 1/4 cup nutritional yeast… I may try it next time without the yeast. But I loved the soup. In the Instant Pot, should the Manual or Soup setting be used? I used the Soup on high pressure programmed for twenty minutes and after the natural release, all liquid was gone, the ingredients were a thick mash, and the pot was close to burning at the bottom. The beans were also not fully cooked. I added two more cups of water afterward and mixed but still didn’t find it to be soupy. It would be the manual setting. Any recipes that don’t specify a particular setting would be manual. It is a super thick soup, but you can always add more liquid if you prefer it thinner (before or after cooking). This sounds so delicious! I love everything in it. I have an IP, but it works better for my schedule to use the slow cooker today. I must admit I’m very nervous about not soaking the beans ahead of time. I just didn’t know you could throw them in dry. I’m using Great Northern instead of Navy beans because that is what I have. Do I need to cook them longer because they are a larger bean? They should cook at about the same time. There is always leeway with beans though, because the longer they’ve been stored before they got to you, the longer they take to cook. I had a similar issue of my beans not cooking and the peas needing more time to thicken. I used sautee for another 20 min or so and it improved. More time pressure cooking would have been good. I also added carrot, yum! I made it so long ago that I’m not sure. But usually I do 1 1/2 cups as a serving. This is really good! Here are the changes I made: used 4 cups of mushroom broth, as I had some that needed used up. Added smoked paprika to season during cooking. Because I had some fresh corn on the cob that needed use, I simmed the kernals a soft boil about 5 minutes, and stirred it in at the end of cooking the split pea soup. I seasoned with Nama Shoyu soy sauce rather than salt, at the end. I know, kinda changed it all up. The fresh corn kernals add a nice sweet crunch to balance out the soup. Oops, forgot to mention, sauted shallots in dark sesame oil in IP prior to adding rest of stuff. This worked nicely for me!! Definitely needed a decent amount of salt at the end to bring out that smoky flavour, but I found that the nutritional yeast helped with that too! It does seem watery when you first open the instant pot, but if you give it a really good few stirs, the split peas distribute and it turns quite thick! Oh, and we subbed regular potatoes in since we still have so many to get through from the garden last summer. So good! I was surprised at how creamy adding the nutritional yeast made the soup. Easy. Filling. Delicious.